Cars head east on busy Post Road East in Westport, in front of the Shake Shack restaurant, where a Fairfield lawyer was struck and killed in March. The estate of a Fairfield lawyer struck and killed by a car in March while attempting to cross Post Road East near the Shake Shack restaurant has filed a lawsuit against the town and state Department of Transportation, claiming both are liable because of the lack of a pedestrian crosswalk. The death of Bruce Tabackman, 68, was the fourth pedestrian fatality on a stretch of Post Road East in the last five years. Town Attorney Ira Bloom on Wednesday had no comment on the lawsuit filed by Liberty Mutual Insurance on behalf of Tabackman's estate. The lawsuit, filed May 16, asserts "a potential claim of liability and/or apportionment and/or contribution for damages claimed by the Estate of Bruce Tabackman as a result of a defective condition of the roadway on Post Road. 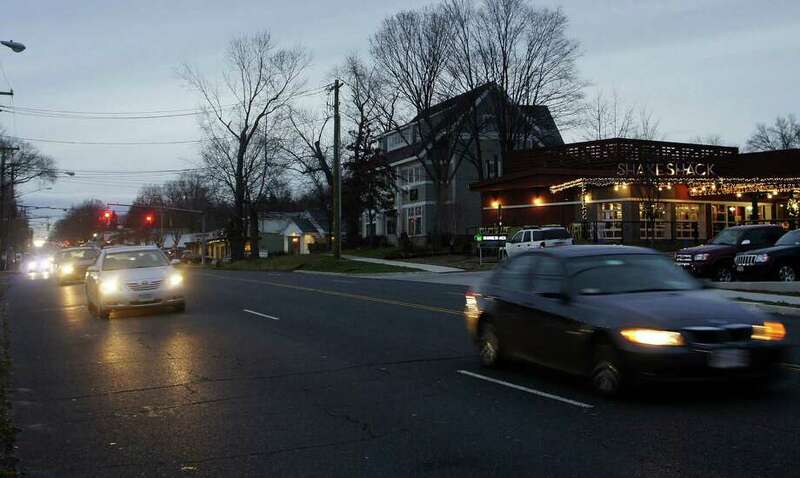 "More specifically lack of pedestrian crosswalk outside of Shake Shack Restaurant on Post Road in Westport, CT, which due to a lack of, caused by the negligence of the Department of Transportation and its employees, resulted in the death of Bruce Tabackman." The lawsuit also claims that "the state caused, allowed or permitted the defective roadway to exist and did not properly ensure the safety of the restaurant patrons failing to prevent the unsafe condition from occurring and causing this accident." Kevin Nursick, a spokesman for the Department of Transportation, did not return a call seeking comment. Tabackman was not in a crosswalk when he was struck by a car driven by a Westport 16-year-old, according to Westport police. There is a nearby pedestrian crossing with signal heads linking the south- and northwest corners of the Post Road East-Bulkley Avenue intersection. And, in the aftermath of the Tabackman fatality, state officials advanced plans to this summer to add a second crosswalk that will link a gas station at the southeast corner of the intersection to an office complex at the northeast corner. It would include two countdown-signal heads. Installing the crosswalk will cost approximately $50,000, according state officials. In November 2011, a Shake Shack employee was seriously injured when she was hit in the same section of Post Road East. She was cited by police for not using a pedestrian crossing.